Black Magic Woman - Live! 15. Hey Joe - Live! 16. Sunshine of Your Love - Live! Mable House gig - huge crowd! great Festival at the Lake! Great night at the Mable House!
" Good for all ages"
" Opening for Sarah Evans"
Cold but great Festival.. attended by 5,000 people! Atlanta's Premier "NON CHEESY" Wedding/Party Band! 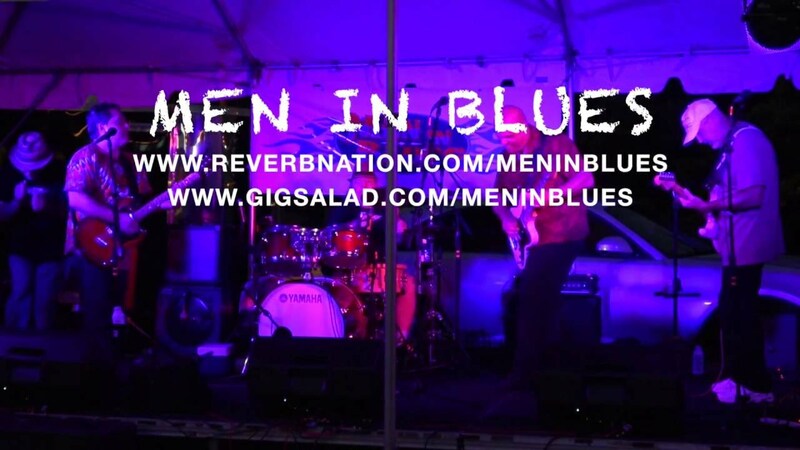 MEN IN BLUES is a highly experienced, energetic Atlanta Wedding/Variety/Cover/Party band that plays Funky Classic Rock & Roll, Soul, R&B, Funk, Blues, Oldies, and Country. They've been rocking around town for over 18 years to enthusiastic crowds. Something for everyone! Voted BEST BLUES BAND & BEST OVERALL BAND 2017, 2016 & 2015 By The Atlanta Society Of Entertainers! These guys are popular seasoned musicians who have real talent. As the event planner, I was thrilled and relieved at all the compliments I received about the band. It became obvious the guests enjoyed the music since, throughout the evening, I noticed the number of people who don't usually dance were on the dance floor more than a few times. The group was prompt, professional and reasonably priced. Additionally, the music was at a sensible volume - not blasting us out of the room. We booked Men In Blues for our wedding and could not have been happier with their performance! Everyone we talked to afterward agreed that the band did an amazing job. They especially did a good job of reading the room and mixing up the set list in order to keep everyone on the dance floor all night. We cannot recommend them enough! Men in Blues played for my daughter's wedding. A second daughter have me a lot of flack for hiring a "rock and blues" band. No body will be able to dance to that she said. Boy was she wrong. The dance floor was crowded all night. I have received compliments on the band from basically all of my guests. They were flexible and even traveled out of their comfort zone for my gig. Thanks guys! Not much to add to the other positive reviews. I booked MiB for my wedding and they were excellent. Professional, fun, and high-energy, they had everyone at the reception up and dancing! Men in Blues is a great party band. They played our annual chili cook-off at our subdivision and were a hit. Great music-very tight! They played blues and other oldies (oldies by my standard-Allman Bros, a little Zep. Professional, showed up on time, and we plan to use them again next year. We booked MIB for our wedding on April 18, 2015 and it was one of the best decisions we've made. My wife and I love rock n' roll, country, and blues and wanted to book a band that would get everybody up and dancing. We are a week removed from the wedding, but my wife and I are still blown away by how packed the dance floor was all night - even people that claimed they HATE dancing were up and dancing all night! They are incredibly talented musicians who are very professional and will work with you to make sure that your reception goes off exactly how you want. Simply put, book MIB with confidence - you and your wedding guests will have an amazing time. Anytime you need a live music "Fix"; this band rises above the competition. With a cache of music from all genres, this band is a cornucopia for your ears! I highly recommend giving them a listen. A splendid time is guaranteed. Everyone had such a great time! The variety of music was perfect for our dinner dance reception. The guys are professional and working with them was easy. Our guests' biggest complaint was that the party ended too soon--they wanted to keep dancing through the night! I highly recommend Men in Blues for your event. Highly recommend this band for your event. We had Men In Blues play our wedding on September 6th. They were amazing. I am a huge music fan and very particular about the quality of music. Men In Blues exceeded my expectations. They are incredible musicians. We had an very easy time setting up the schedule and announcements with them. They are extremely professional but most of all they are a rockin band that had people dancing all night. Our guests who came from Philadelphia, Miami, Alabama and even Germany loved them. Men in Blues played our wedding reception and we had people out of the dance floor all night long, including people who claim they never dance at weddings. MiB was easy to communicate with and was helpful every step of the way. I would recommend them for any occasion. A Perfect Part of Our Perfect Wedding Day! We are so lucky to have found Men In Blues for our wedding day! Aside from being so easy to work with, they set the tone for our incredible wedding reception! From my grandparents to my college friends, everyone was on the dance floor! Thank you MIB for helping to make our wedding day more than we could have ever dreamed of! 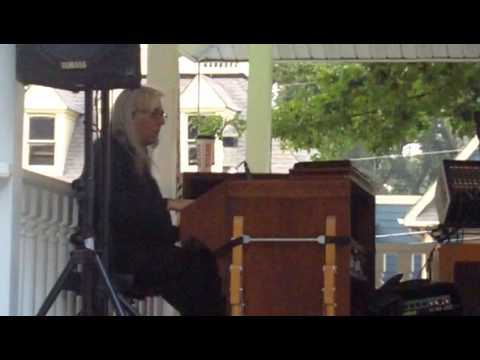 My wife and I arranged for the Men in Blues to play at our wedding recently. One of the most important things when try to plan and execute such a big event is communication. We were very pleased with the prompt responses from the band members in regards to our big day. Most bands I came across while searching were outrageously priced. We found the Men in Blues to be much more reasonable in that area, and quite frankly, they are better musicians. On our wedding day the band showed up early to set up, and they started on time. The band members were very professional, laid back, flexible with requests, and most of all, they were extremely talented musicians. They played great songs that my family and friends loved. All night long the guests were commenting on how much fun they were having and how awesome the music was. The band even let me join them for a song. My wife and I were pleased and would definitely go business with them in the future if we had another event in that area. Men in Blues is the way to go! Men in Blues was by far one of the most memorable components of our wedding weekend! The band took care of everything while catering to our individual needs and specific musical requests. Very familiar with playing weddings, we chose to let the band take over, and they did a fantastic job! Guests of all ages commented on how wonderful they were, and almost all of our friends (many of whom don't normally dance), were on the dance floor! I would recommend this band to any couple getting married! From the very first song to the end of the evening people were on the dance floor! Everyone was having fun! I had not seen my 62 year old sister dance since she was in high school and she was dancing the night away! If you want a great band with lots of personality and lots of participation you must hire Men in Blues!! I'm so glad we did!! Don't think we could have found a better band to please the people , everyone was talking about them. You know you have a good band when the other bands stand by the stage and talk about how tight and smooth they are. knowing they will rock the house up there like they did down here. You were all such gracious and fun hosts...Barnesville is a great little City...the people there sure do love their Music! Thanks for having MIB at the BBQ Fest.... We are looking forward to September! These guys make the party. Period. After seeing them play at St. Patrick's day event at the Olde Blind Dog in Milton, GA we signed them up for our wedding this past weekend in Young Harris, GA. Growing up on blues, and classic rock like the Stones, Pink Floyd, etc, the band was exactly what we wanted to entertain the guests who flew in from all around the world to celebrate with us. The comments on the band the next day were all positive and the dance floor literally stayed full the entire time the band played which went late into the night. We sincerely appreciate the impact Men in Blues had on our event and would fully recommend considering them as part of your celebration. Cheers guys! Best cover band by far! MEN IN BLUES was by far the best choice we made a couple of weeks ago when we threw my dad a surprise 60th birthday party. My dad is a huge blues fan so we were a little nervous of the outcome; however, I must say Men in Blues was phenomenal. They kept the guests entertained from the very first song they played, the Beetles version of Happy Birthday. We had about 65-70 guests in attendance and everyone of the guests were amazed and had nothing but good to say about Men in Blues. In fact, my dad has since had many compliments at the local coffee shop in the morning about how good the band was. My dad and several of his friends have already picked a date in which they are going to go see Men In Blues perform again. If you are looking for the most reasonable and best cover band in Georgia, or the southeast for that matter, hire Men In Bluesou will not be disappointed. Thanks guys you rock! It was our pleasure to play for your Dad's party..we all had a great time and the venue was fantastic! Come see us again one day! MEN IN BLUES is the best band you could possibly hire for a wedding or special even where you want people to enjoy great music and get up and dance. My wife and I hired them for our wedding and they had 90% of our wedding guests on the dance floor. We needed a bigger dance floor!! We were moving tables!!! They play a mix of blues, rock, soul, funk to perfection and really know how to interact with the mood and feel of any kind of function. I am a musician myself and they happily let me get up and play a few songs for my friends and family. Some of whom had never ever seen me play. This was a huge highlight of my wedding for me and they were not only welcome to the idea, they encouraged it. They went above and beyond and truly made our wedding reception a great fun and jamming dance party and I would recommend them for anybody's wedding or other function for that matter. They are very professional, punctual, easy going and very moderately priced for they amount of fun and tight music they bring to your event. I give them 5 stars and will be using them in the future come what may and I'll be checking them out locally whenever I get a chance. Don't think twice about these guys if you want to make your event AWESOME unless your more into obnoxious DJ's who don't play what you ask and like to talk more than play music. MEN IN BLUES!!! Five stars * * * * * !!!! That was a fantastic time Grant! ..thanks for hiring us and we are happy that you had so much fun! If you guys are thinking about hiring a band for your event, look no further. These guys are incredible. They played my best friend's wedding a few years ago, her sister's wedding last summer and my wedding just last month. Men In Blues was our most complimented decision for our big day. They are so interactive with the crowd, that people who are not big dancers (like myself) were out on the dance floor. The base guitarist was actually in the crowd playing! Everyone, even the hard to please, were highly impressed. These guys truly are amazing and will not disappoint. Thank you so much Men In Blues!!!! Thanks Lynn..we all had a great time with everybody and come see us again one day! I unexpectedly found myself at the square in Marietta today for lunch. I had no idea it was the big day for the Taste of Marietta. The most memorable thing there was the band! I was really impressed with the sound and variety of music. I will go see them again for sure. They rocked the event for sure. Old Dudes Rock! ... thanks Kim!! Wow! I have to say that I was a bit nervous choosing a band for our wedding reception, and these guys rocked! We had such a wonderful time with them at our reception. They were super entertaining and pleasant to communicate with. I'd recommend men in blues for any gal like me that just wants to dance!! I have had many compliments pertaining to our reception music, and I do remember seeing more people than not-dancing the night away! Good times! Thank you guys!! It was our pleasure to play for your wedding Reception Olivia..good times for sure!! I am very critical of bands. There are very few local/regional bands that I really appreciate and these guys are among the best, one of the few bands that I look to find when entertaining. They play a good variety of lively music. They are fun to watch and they REALLY know how to play the Blues! We appreciate the kind words and look forward to seeing you again! My sister and I were invited to Henry's of Acworth to hear this wonderful blues band... I am not sure I have ever been so entertained by not only wonderful music but wonderful personalities of the band! Ian you are a magnificient entertainer, thank you so much for providing a wonderful evening for me and my sister! Two beautiful Rocking sisters...woo hoo!! These guy's were great at the Taste of Marietta. Was Visiting from Chicaga area and was fortunate to hear them. Keep on ROCKIN!!!!!! Men in Blues did an awesome job at our wedding! As soon as Andy and I walked into the reception everyone came running up saying "your band is awesome!" We really appreciate Men in Blues working with us so last minute to learn our song for our first dance. They were super professional and super flexible. Thank you SO SO much be for being so great! Mad props! What a great nite @ Social Vinings. You dudes do rock!! Can't wait to see you guys again. Men In Blues were AWESOME!! We could have asked for a better band for our wedding. If you like all your good Rock n' Roll Mustang Sally, Honky Tonk Woman, The Doors and Brick House all mixed together. This is your band. Everyone of the guys are extremely talented and never missed a beat or a note! Everyone was so impressed with the at our wedding, people kept saying "the band is great, where'd you find them"! Thank you so much MIB for putting on such an amazing show for our wedding guest and us! Look forward to seeing you play again!! We're Groupie's now!! :-) Thanks! Thanks for having us..it was a great time and the wedding party and guests were fun! We love our fans & friends...thanks! to be honest can't remember that last time you were here..... Been so long boys,THE TAVERN on Bells Ferry. You rock saw you at The Lone Star as well, we follow you when we can..you old dudes ROCK !!! LOVE YOU ! Thanks Sydney!! We appreciate the kind remarks and come see us soon...schedule is on our web page. MEN IN BLUES is an amazing band! They play here every month, sometime even twice a month. The crowd loves them because they really pay attention to what the crowd wants to hear....so much fun!! Thanks Christy!! We love our fans and we love Social Vinings..great place!
" A great time will be had by all! .... We play, They Come, They stay!" "In a sea of mediocrity, we stand out! 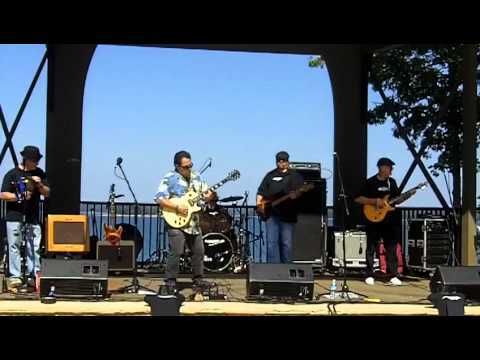 MEN IN BLUES Opened for Sara Evans at Piedmont Park Dogwood Festival April 2013! 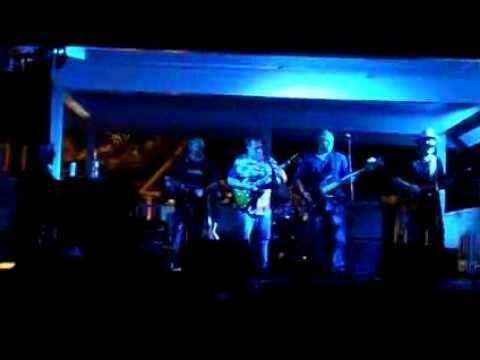 MEN IN BLUES - Grand Finale Act for Barnesville BBQ/Blues Fest April 2013! MEN IN BLUES has been entertaining around the Atlanta metro area for over 14 years to enthusiastic crowds. Made up of 5 professional, fun loving musicians that know how to get your party jumping! When you see them perform, you'll know that the music is a passion, not a hobby. MIB is an Atlanta wedding/party band that plays a great variety of Blues, Classic Rock, Soul, R&B, Funk, Oldies, Classic Country. What's their specialty? Making your event even better! Ian founded MEN IN BLUES back in 2000, and it's been going strong ever since!Classically trained on clarinet and Soulfully trained on guitar and vocals, Ian has been into music from a young age. His parents would play Canned Heat, John Sebastian and Beatles albums for him to listen to, and he'd pick up the recorder (remember those?) and play along. Ian got his start as a young vocalist in Middle School when he was a member of the almost famous " band that played in the gym." That was the spark that made him want to play guitar and sing. Whilst studying clarinet around 1976, Ian picked up the guitar and started jamming with records and other musician friends. Since he loved singing, the guitar was a perfect match for him. Ian's now been performing live shows around the Northeast and Southeast for over 25 years. Ian is a graduate of The Crane School of Music (SUNY POTSDAM) and holds a K-12 Music Education degree.He currently teaches music in Cobb County Schools, and he also teaches private guitar lessons to all ages. Ron moved to Atlanta recently from Tampa FLA, and has played with Jimi Hendrix back in 1969, Greg Allman, Al Wilson, and still plays with Bertie Higgins ( of "Jamaica Me Crazy" and "Key Largo" fame) down in FLA! Lee is the newest member of Men In Blues, joining the group in 2012. He plays bass guitar but occasionally switches to rhythm and lead vocals as needed. As a teenager, Lee grew up in and around the Atlanta music scene during the late 70's and 80's, working at various guitar shops by day and playing clubs and parties by night. Over the years, Lee has performed hundreds of live shows with several hard-working bands such as Tyranny, The Boosters, Mixed Company and Loose Change. As a singer/songwriter, Lee often performs solo acoustic dates at local neighborhood venues. For the last ten years, Lee has also served as lead vocalist and lead guitarist for the Transformation Band (T4B) in west Cobb County. Lee loves and appreciates all musical genres but believes that nothing can surpass the heart and soul of classic R&B. Lee's philosophy on playing bass: "The notes you DON'T play can be just as important than the ones you do. You gotta find the groove and then lay down in it. That's where the music is." Danny was born in Atlanta, Georgia on February 25, 1948. He recieved a guitar for Christmas in 1961, and has never laid it down. He was shown his first chords by a family friend and his first song (The Wildwood Flower) by his uncle. He is mostly self-taught. A true "musical sponge," and eternal guitar student who has learned something from every guitar player he has ever met. He began performing at local talent shows and contests in 1963. He joined his first working band at age 15, and began performing all over Georgia. In 1964-66, he was a member of Ougie And The Ougots, a popular local rock band that performed all over the Southeast. The group had a record in 1966 that sold moderately. In college, he was a member of The Vagabonds, the hottest soul band in Georgia. Since then, he has been a member of many bands playing a wide variety of musical styles. He performed at dances, fraternity parties, night clubs, concerts, local television shows, weddings, fashion shows, bar-mitzvahs, recording sessions, store openings, and other assorted functions throughout high school and college. He graduated from DeKalb College in 1970. His personal playing style is a soulful blend of blues, rock, country, and jazz. His notable musical influences include Chet Atkins, James Burton, Roy Buchanan, Mike Bloomfield, Danny Gatton, Ry Cooder, B.B. King, Freddie King, Albert King, Wes Montgomery, Lonnie Mack, George Harrison, Roy Nichols, Don Rich, and Barry Bailey. He was very active as a working musician during the once great "heyday" of the Atlanta club scene from 1970-90, often playing long hours 6 or 7 nights a week. All performance venues should have electricity nearby and if it's an outside gig, shelter should be provided for the band. April 29, 2018 • 1:00pm - 5:00pm TASTE OF MARIETTA - MARIETTA SQUARE!! September 08, 2017 • 6:00pm - 8:30pm Keheley "'Blues On The Blacktop"
September 02, 2016 • 6:30pm - 9:30pm MIB Lite-featuring Danny and Ian Aco6. "Men in Blues" were fantastic at a surprise Bday party given for me. I'm an old rocker & Bluesman & these guys played all my favorites & great party/dancing music. It was indeed a pleasure to sit in with them on a tune. The band was very tight & had great tone. They blew the whole crowd away with the Pink Floyd song "Comfortably Numb". The party is one of the most memorable moments of my 60 years & "Men in Blues" was certainly a big part of it. I've seen them since at Nick's Place in Marietta & listen to their music on CDs. I will be taking friends to see them & letting people know what a great band we have right here in ATL. Keep on Rocking "Men in Blues"! The music was great! Ian was very easy to work with. The band interacted well with the crowd and got everyone dancing all night. I would use them again for future events. Fantastic job all around by the group MEN IN BLUES. We had people coming up to us all night long complimenting us on our band choice. People were wondering where we found this great band! Thanks MEN IN BLUES.....you guys were great! MEN IN BLUES Played for my 50th Birthday party, and it was a very enjoyable night. My guests were commenting on the quality of the band and how much they liked them. Great Job playing at our Holiday party....all I heard was compliments regarding your show! We hired MEN IN BLUES, based on someone else's suggestion, and it turned out to be a great choice! THey learned special requests that we wanted, and demonstrated true professionalism during the wedding reception. The wedding reception was held @ Windermere Golf Resort on October 13th, and everybody loved them! I highly recommend this group!! At the Grant Park neighborhood's 34th annual Moth Ball - Men In Blues ROCKED THE HOUSE!!! They had folks from 20 - 70 up and dancing all night. So many people came up to me and said "These guys are great!" They we're a delight to work with and probably would have played all night. They have my highest recommendation for making the party fun and funky for all. MEN IN BLUES - OLD DUDES DEFINITELY ROCK! MEN IN BLUES did a great job at our wedding reception. We love their attitude and professionalism. They even helped with our ceremony music. All of our guests were quite pleased and everyone had a lot of fun!! MEN IN BLUES did a great job playing for a large wedding party here on June 2nd. I look forward to hearing them again in the future! What I want to know is what are these guys doing playing clubs? They are professionals all the way! DOn't miss you chance to see them at Olde Towne Bistro. They will be playing here once a month until further notice. We were totally happy with the way MEN IN BLUES entertained our guests at our wedding reception. The music was top notch, and what we really liked is that the band could please all ages, from kids to the senior crowd. THanks again for the great time! Don and I were very happy with MEN IN BLUES' entertainment for our wedding reception! They played all sorts of great music for us and our guests. We got many compliments on our band selection....everyone was wondering where we found them! Thanks again MEN IN BLUES for your professionalism and musical abilities. Thank you so much MEN IN BLUES for helping to make our wedding reception so fun. All of our guests loved your music, and we're sure that you'll get some calls about entertaining in the future. We really appreciated that you learned some special songs for us, and of course how well you played them! 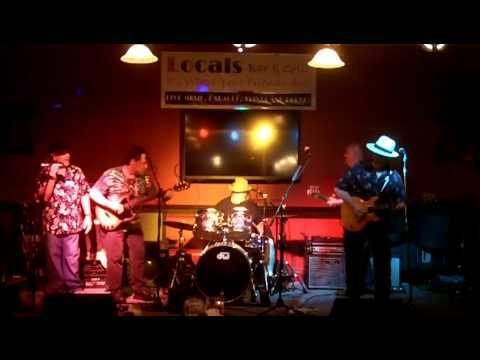 MEN IN BLUES is a professional group of musicians that is very popular with many residents of Roswell. They are excelent at what they do! This is their second year of entertaining for the City of Roswell's " Alive after 5" monthly celebration. We're planning on having them back for 2008. "I was very impressed with the band MEN IN BLUES. They played well and most importantly, they were able to play quietly with dynamic control. Their song selections were fantastic too! MEN IN BLUES is on my top list for referrals, and I will be recommending them on a regular basis should anyone ask for a great band!" MEN IN BLUES played at our 2007 SPIdynamics office kick-off party which was held at the Dunwoody Country Club this past January. They are a fantastic group that can please everyone, since they play such a nice variety of material. Everyone was talking about how excellent the band was, and we will have them again for another gathering! We had MEN IN BLUES play at our son's Bar Mitzvah and it was a great time for the whole family. The celebration was held at the Doubletree Hotel in Roswell, and all of our relatives spoke very highly of the band. Ian Nathanson and his group are professionals that knows how to direct the party! MEN IN BLUES has been playing here once a month for about 5 years. They are a consistently excellent band that keeps the crowd coming month after month, year after year! This band is a winner for any type of social gathering, including weddings, parties etc. MEN IN BLUES has been playing at the Taste of Marietta for the last 5 years to crowds of over 50,000 people. Everyone loves this band, and I've already hired them for Spring of 2008. Just a great bunch of guys that really enjoy the music they create! MEN IN BLUES played for our Junior/Senior Prom at the Biltmore Hotel in Atlanta. All of the people that attended the prom enjoyed their music and they kept us dancing all night long! Thanks again MEN IN BLUES! Outstanding job was done by the band MEN IN BLUES. They exceeded our expectations, and I will gladly reccomend them to anyone who loves great music and cool guys! Fantastic music and terrific people to deal with. Everyone had a blast and we were totally satisfied! I can't even tell you what a great job MEN IN BLUES did for our wedding reception. They sounded so good and all of our guests were complimenting us ( and them) for the great choice of band and music. This band is tight, and the patrons totally enjoy themselves when MEN IN BLUES plays here! One of the best bands that we've had at our bar! They know how to please the crowd and everyone was dancing. What a party scene! They were the hot topic at one of our Manager's meetings recently.